Salted caramel is a fantastic invention. Over the years I have eaten litres of the stuff: in beautifully filled chocolates; swirled into ice cream; and most frequently, straight out of a jar, with just a teaspoon and a big smile. Miso caramel on the other hand, is a new discovery for me - and what a revelation. Who knew perfect could get any better! The addition of this umami packed paste adds both a saltiness, and a depth of flavour, making it even more addictive. This dessert is a deconstructed crumble (another dish close to my heart) and transforms the humble pear into a decadent treat. If you have any leftovers, then you are in luck. Simply chop and serve with your porridge or overnight oats for a heavenly breakfast. First, make the crumble. Place the flour, oats and sugar in a bowl, and rub in the solidified coconut oil until combined, ensuring no big lumps remain. Sprinkle the mixture evenly onto a non-stick baking sheet (or one covered in foil) and place in the oven for 20-25 mins until golden brown. Next, prepare the caramel. Place the maple syrup and miso paste in a bowl and mix in the milk, making sure there are no lumps. Put aside. Now, remove the seeds from the pears using a teaspoon. Heat the coconut oil in a frying pan on a medium heat. Once hot, add the pears face down. Cook for about 5 mins, until brown on one side and starting to soften. Turn over, and cook for another 5 minutes or so until the whole pear feels soft and cooked. Next, add the caramel mixture over the pears and into the pan, making sure you swirl it around so the pears are covered. Heat on a low simmer for a few minutes until it starts bubbling and thickens to a syrupy consistency. 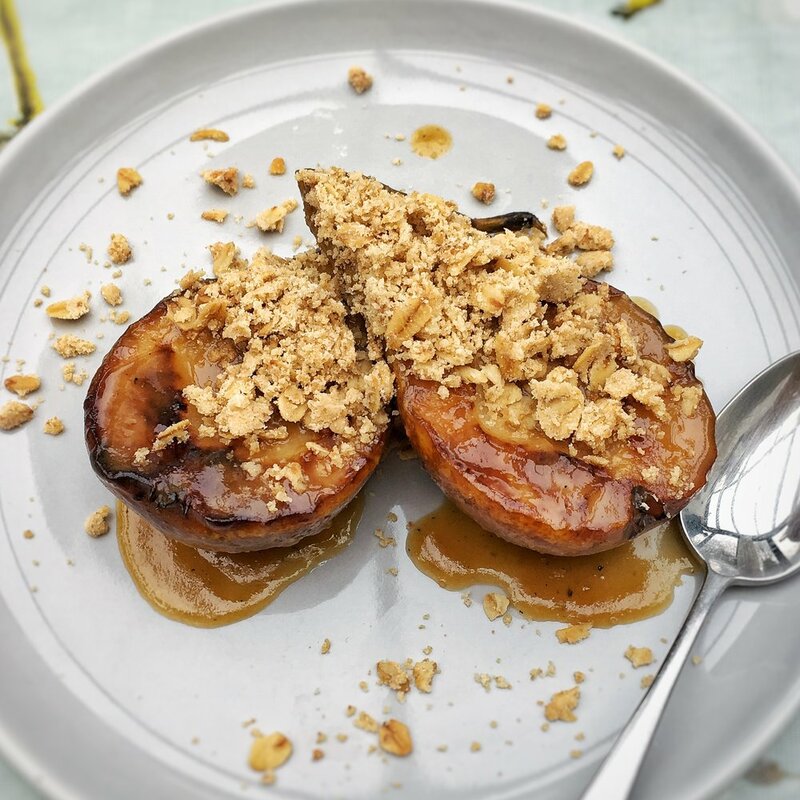 Remove and serve immediately with the caramel drizzled over the pears, then topped with the crumble mixture. Perfect with ice-cream (vegan or otherwise).